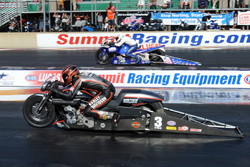 NORWALK, OH - Harley-Davidson® Screamin’ Eagle®/Vance & Hines rider Andrew Hines scored his third Pro Stock Motorcycle win of the season at the Summit Racing Equipment NHRA Nationals to keep the Harley team perfect after six events on the 2012 schedule. Riding a Harley-Davidson® V-Rod® motorcycle, Hines defeated Lucas Oil Buell rider Hector Arana Jr. in the final at Summit Motorsports Park. Hines was the top qualifier for the event with an Elapsed Time of 6.961 seconds in the final qualifying round on Saturday, snatching the top seed away from Lucas Oil Buell rider Hector Arana Sr., who had been No. 1 on Friday with a 6.962-second run. Harley-Davidson® Screamin’ Eagle®/Vance & Hines rider Ed Krawiec qualified fifth at 7.005 seconds on the team’s other Harley V-Rod. In Sunday elimination rounds, Hines had wins over MB Precision/LAT Racing Oil Buell rider Mike Berry and Suzuki rider Steve Johnson before facing his teammate, Krawiec, in the semi-final round. Krawiec defeated Gottspeed Racing Buell rider Michael Ray in the first round and got an automatic win in round two when Geico Suzuki rider Karen Stoffer fouled at the start. Hines prevailed in the all-Harley semi-final round, with a 0.025-second reaction time and 6.978 ET to Krawiec’s 0.029/6.982 pass. The other semi-final featured a father/son showdown, as Hector Arana Jr. defeated Hector Arana Sr. to take his Lucas Oil Buell to the final. Hines got his 28th career victory with a 0.043/6.929 run to Arana Jr.’s 0.073/6.928 pass. Krawiec continues to lead the NHRA Pro Stock Motorcycle division with 597 points after six events. Hines is 26 points back in second place with 571 points. Arana Jr. moves up to third place with 484 points, followed by Arana Sr. with 467 points. The Pro Stock Motorcycles will be in action again on July 20-22 at the 33rd annual Mopar Mile-High NHRA Nationals at Bandimere Speedway in Morrison, Colo.